Common Name : Hibiscus Flower, Lipstick Flower, China Rose, Shoeback Plant, Kinaros, Aute. Part Used : Leaves And Flowers. Habitat : Commonly cultivated as a garden ornamental shrub from sea level to 500m. 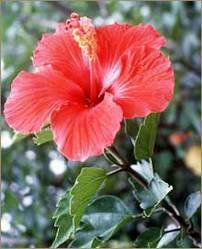 Uses : Hibiscus Rosa Sinensis helps in inducing abortion, provide treatment for headache. Young leaves are sometimes used as a spinach substitute. Flowers can also be made into a kind of pickle or used as a purple dye for colouring foods such as preserved fruits and cooked vegetables. Root is edible but very fibrousy. Its also good for hair treatment.„h The leaves and flowers are beaten into a paste and poulticed onto cancerous swellings and mumps. The leaves are anodyne, aperient, emollient and laxative. A decoction is used as a lotion in the treatment of fevers.